This ethnic Nativity comes from the Gurung people in Nepal’s central hill region. The bodies of this Nepalese Holy Family are made of recycled wood products and the clothing from corn husks. 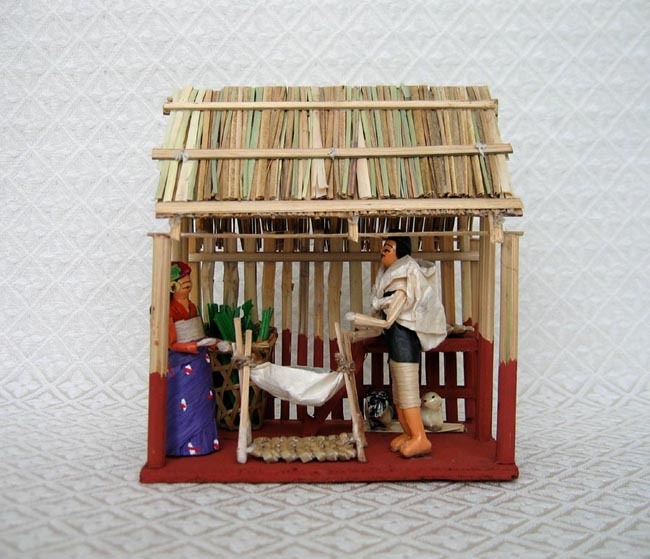 The stable is made from bamboo and other local grasses of the eastern mountain district of Nepal. The stable measures 6.25 inches tall. Nepal Knotcraft Center trains, employs and empowers socially and economically underprivileged women in Nepal, giving them opportunities to earn an income and support their schooling. The organization started by training women in macramé knotcraft. Over the years, their product line evolved to include Dhaka weave textiles, cornhusk dolls, bamboo baskets and other natural fiber products, many drawing on local designs and traditions. With a product line made from mostly recycled and indigenous materials, Nepal Knotcraft Center’s products occupy a unique niche in the marketplace. The center runs a savings program for employees, and artisans receive bonuses when orders are sufficient. Literacy classes are offered to help empower the women.